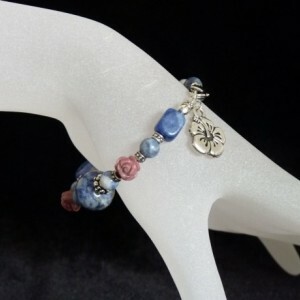 I knew the minute I saw these dainty Rhodochrosite carved rose beads that they were meant to be paired with Sodalite! 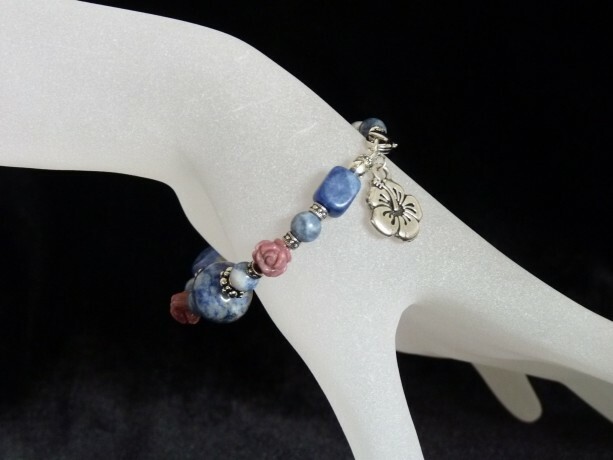 The softness of the sodalite colors and the rose color of the Rhodochrosite create a warmth in the heart. I used Sodalite nuggets of different shapes and sizes, and its strung on Softflex nylon-coated 21 strand wire for durability. All the silver-plated findings are high-quality lead and nickle-free pewter base with silver plating: the spacers, clasps, jump rings, and Hibiscus charm. This is my go-to bracelet. Looks fabulous with faded jeans for casual (especially paired with a leather and/or silver chain bracelet) or dressed up with a mauve or rose sweater. Great gift for a close friend, or for yourself! Your new treasure will arrive nicely packaged and ready for gift-giving.